When you know in your heart the person you love is not right for you, what do you do? Gabriana has a hard time realizing this in Escape From A Nightmare by Stephanie Acon. Gabriana meets Scholar and starts on a downward spiral because she will do whatever it takes to acquire the number one spot in Scholar’s life. On the other hand, when Gabriana meets Khali she experiences a totally different kind of connection, but Gabriana’s dependency and mood swings keep Khali confused. After experiences some unfortunate events, Gabriana, realizes she needs to do some soul searching, which leads her down the road of rediscovering her purpose. 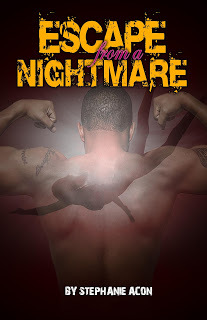 Escape From A Nightmare is about struggles, relationships and learning from mistakes. The main character goes through several challenges and her ability to overcome them through her new found spirituality was exciting to see. The twists were unsuspected as the author takes readers on an enlightening journey that keeps you hanging on until the end. At times I did not know whether to be frustrated or sad for Gabriana but I enjoyed this character. I recommend this book to others.